I’m very happy when I can make a masculine appropriate card that does not involve fishing, golfing or some other kind of sport. LOL! 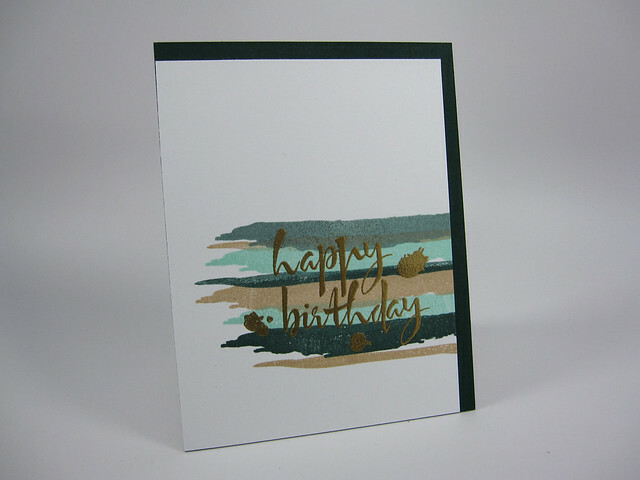 For this card I used more subdued shades of green and a kraft-colored ink to slightly brighten up things. I love the artsy look of the brushstroke stripes in these colors. The stripes slightly overlap each other and are paired with the brushstroke “happy birthday” sentiment from Avery Elle. I stamped the birthday sentiment and ink blots (also from the same Avery Elle stamp set) in Versamark ink and then heat embossed them using gold embossing powder. The two stamp sets really complement each other and the gold embossing powder gives the card a richer look. My inspiration for this card came from Maile Belles. 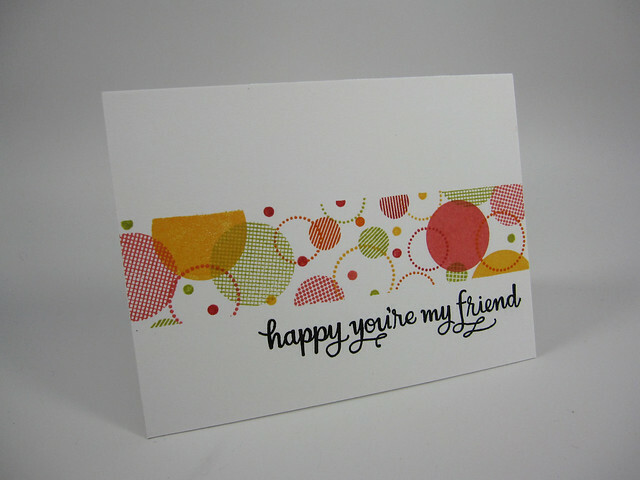 She is on the design team for Papertrey Ink and she designed the brush stroke stamps I used for this card. I love Maile’s creations. She has a very identifiable style which I can’t fully describe. It’s part graphic, simple and straightforward. She has a great eye for just the right placement of all the elements she uses on her cards. Love her style. 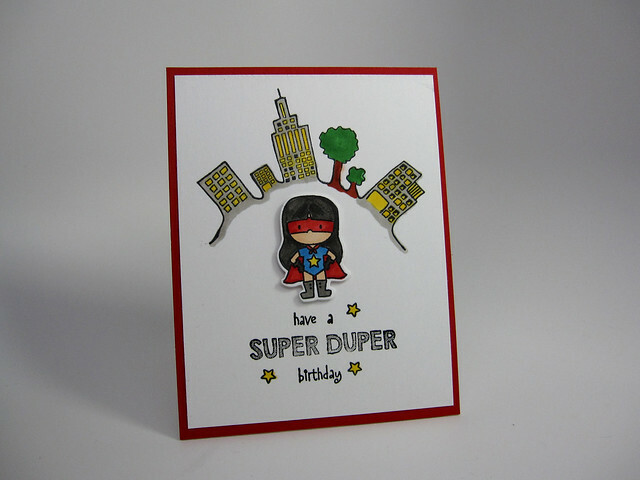 Maile is definitely one of several card makers who are my source for inspiration. Cardstock: Neenah Solar White 80# for card front; Papertrey Ink: Pinefeather for card front mat; Neenah Solar White 110# for the card base. Inks: Papertrey Ink: Ocean Tides, Classic Kraft, Aqua Mist, and Pinefeather; Versamark ink. Other: WOW embossing powder in Gold Rich Pale (for the sentiment and ink splats). I love Ellen Hutson’s shop. They have such a great selection of high-quality stamps and craft supplies. They are initiating a twice a month challenge on their blog! Yay! Some chances for me to win a gift certificate so I can buy more stamp supplies. 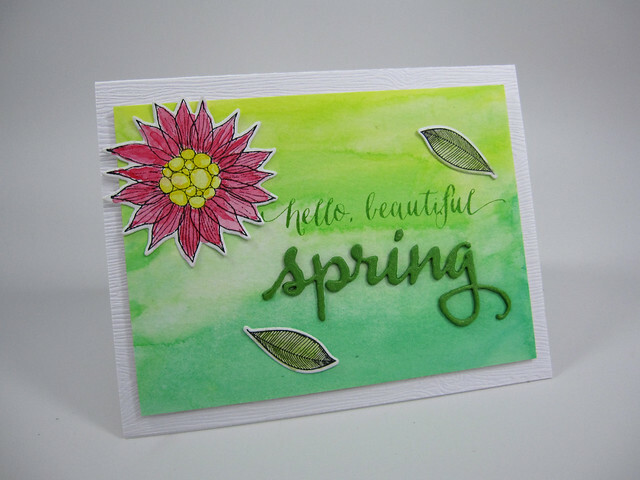 The first challenge is one that incorporates their fairly new line of stamps, Essentials by Ellen which are designed by Julie Ebersole and any Hero Arts stamp or product. I decide to create the card you see above. The card uses the Essentials by Ellen, Hello Gorgeous stamp set and a cling background stamp from Hero Arts, Tiny Star Background. 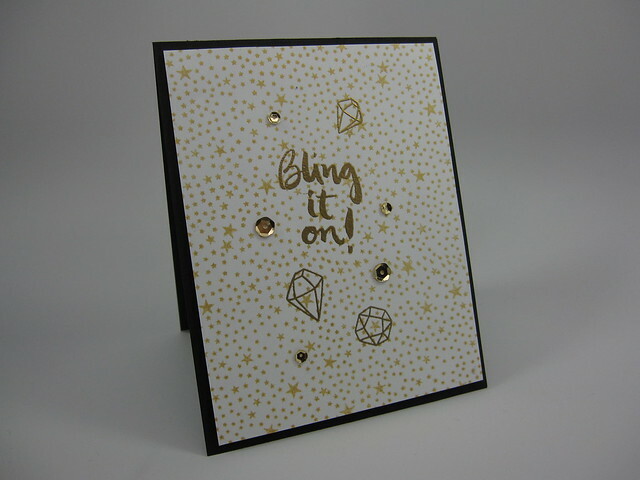 To up the bling factor, I stamped the Tiny Stars background with Tsukineko’s Delicata Ink in Golden Glitz. The sentiment and the diamond images from Ellen’s Hello Gorgeous stamp set were inked with Versamark ink and then heat embossed using WOW Gold Rich Pale embossing powder. I love this gold embossing powder. Not too brash, just a nice rich gold color as the name of the product implies. A few Pretty Pink Posh gold sequins were added to the card front for additional bling. The card front was originally 4.25″ x 5.5″, but I cut it down to 4.00″ x 5.25″ and then used 3-M foam tape and mounted it onto a black top-folding A2 card base. I did this so that the card front had black framing around it to make it pop visually. Stamps: Essentials by Ellen: Hello Gorgeous stamp set, Hero Arts: Tiny Star Background cling stamp. Inks: Versamark Ink, Tsukineko Delicata Ink in Golden Glitz. Cardstock: Neenah Solar White 80 lb. cardstock for card front; Papertrey Ink: True Black for card base. Other: WOW Gold Rich Pale embossing powder; Pretty Pink Posh: Gold sequins; Glue Dots: Micro size (for sequins). This card was made for a dear friend who is under the weather at the moment. I thought that the Spring scene and the sun would reminder her that Spring is coming soon. We’ve had a long cold winter here in the Midwest. For this card, I created my own stencil using My Favorite Things (Die-namics) Snow Drifts die set. There are 2 curvy snow drifts in this set and I chose the more gently curving drift. I die cut the drift from a sheet of acetate from some packaging and used this cut out piece to create the illusion of a hill in the background. I’m really happy when I can extend the use of my dies! The other elements are pretty much die cut and placed as you see. I don’t know what I’d do without my Vagabond machine. The cute stitched tag is from Pretty Pink Posh. As you can see the landscape goes across the card front and onto the tag for visual interest. I also raised the tag using foam tape and hung the sun and cloud off the edge of the tag for additional dimension. Hope you like the card and Spring can’t come soon enough for all of us in the Midwest. Stamps: Papertrey Ink: Flower Fusion #7. Dies: My Favorite Things Die-namics: Flat-Bottomed Clouds die set (larger cloud), Snow Drifts die set (to create the stencil used for the hill); Lil’ Inker Designs: Sunshine Dies (larger sun); Papertrey Ink: Flower Fusion #7 coordinating die (flower and sentiment); Pretty Pink Posh: Stitched Duo #1 tag. Cardstock: Papertrey Ink: Lemon Tart (for the sun); Neenah Solar White 80# for card front and tag; Neenah Solar White 110# for the card base.